Icicles on gutters can signal a problem. What cause them, fixes,...etc- Armchair Builder :: Blog :: Build, renovate, & repair your own home. Save money as an owner builder. We recently had a reader contact Armchair Builder with a question about icicles on gutters. Yogi S. from New Jersey wants to know if he should be concerned about the icicles hanging from his home. Snow has accumulated to about 10 inches on his roof while temperatures have remained below freezing. Yogi asks, “Are icicles on gutters normal? Should I take preventative measures?” Let’s see if we can answer his questions. How do Icicles on Gutters Form? It’s about as simple as it sounds. Water runs down the roof, either from melting snow or from rain, and tries to enter the gutter. When the gutter is free from snow, ice, and objects, the water will run into it and on down to the downspout. Icicles form when the gutter is obstructed and allows the water to run over the gutter and drip down below it. This dripping action in cold weather causes the water droplets to freeze and slowly forms icicles on gutters. It would be rather hasty of us to say the gutter is clogged and this is why the icicles are there. In some cases, this might be the main culprit. However there are a couple other possibilities. First, the attic ventilation may not be adequate. Proper ventilation prevents warm air from accumulating up there. 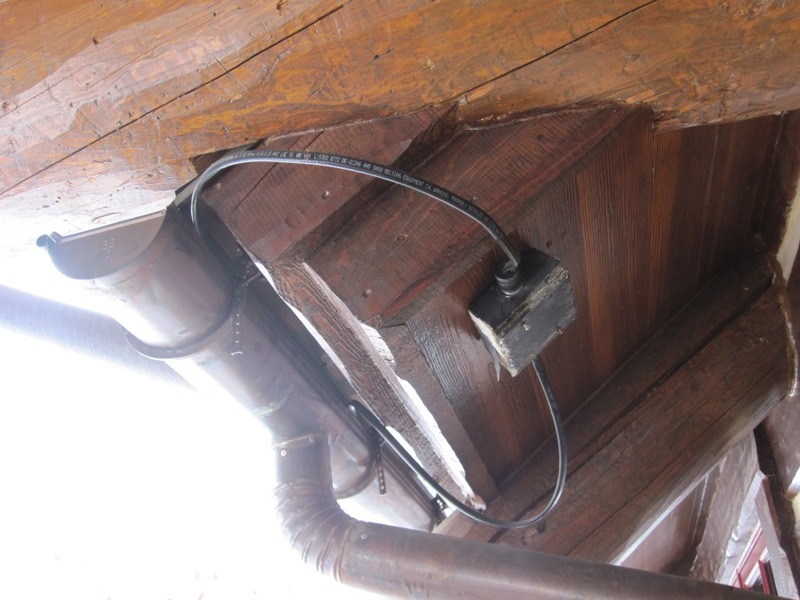 Warm air in the attic is no good for a number of different reasons. When it comes to icicles on gutters, the warm air causes the underside of the roof to warm up and can thaw snow and ice. The resulting water will run down the roof and re-freeze at the eaves or gutters when the outside air is below 32 degrees Fahrenheit. 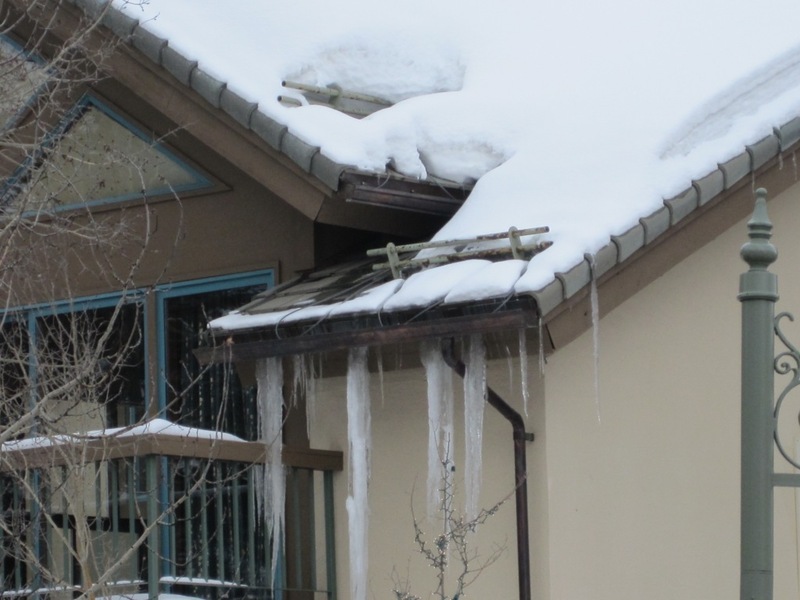 This can cause one of two problems…1) icicles, 2) ice dams. The typical home attic needs one square foot of open ventilation to the outside for every 300 square feet of ceiling area. The other potential cause of icicles and ice dams is inadequate insulation. Missing or inadequate insulation will also allow the air in the attic to warm causing the underside of the roof surface to warm as well. So how much insulation do I really need in my attic? When it comes to solving problems with your home, long term solutions are preferred over short term patches. That being said, it’s important to carefully remove large icicles as they can fall and injure people below and damage the gutters themselves. But this is a short term fix. Making sure the gutters are clean and checking to make sure you have adequate insulation and ventilation is key for long term mitigation. If those don’t prevent the icicles on gutters, you may want to consider heating cables. These can be applied to the eaves and gutters to melt snow and ice to prevent buildup (see photo below).